Flamingo is the southernmost headquarters of Everglades National Park, in Monroe County, Florida, United States. Flamingo is one of the two end points of the 99-mile (159-km) Wilderness Waterway (with another end point at Gulf Coast Visitor Center in the Everglades City), and the southern end of the only road (running 39.3 miles (63.2 km)) through the park from Florida City. 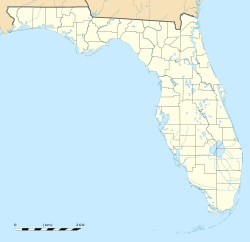 It began as a small coastal settlement on the eastern end of Cape Sable on the southern tip of the Florida peninsula, facing Florida Bay. The actual town of Flamingo was located approximately 4 1/2 miles west of the current Flamingo campground area. All that remains of the former town are a few remnants of building foundations, but it is considered a ghost town. Flamingo Marina from the Florida Bay entrance. Salt/fresh water dam, kayak launch pad, slips, and ranger boats are visible. Flamingo was first settled circa 1892, although Tequesta Indians had lived in the area prior to that. The settlers made a living by providing fish, fresh vegetables and charcoal to Key West. The settlement received its name in 1893 when the settlers had to choose a name for their new post office. They chose the flamingo as the most distinctive bird seen in the area. While the flamingo did not breed in Florida, birds from Cuba and the Bahamas once traveled in large numbers to the area. Flamingos were last seen in large numbers in the area in 1902. The post office closed in 1909. Life in Flamingo could be very unpleasant. Leverett White Brownell, a naturalist, visited Flamingo in 1893. He described the village of 38 "shacks" on stilts as infested with fleas and mosquitoes. He claimed to have seen an oil lamp extinguished by a cloud of mosquitoes. He also stated that flea powder was the "staff of life" and that the cabins were thickly sooted from the use of smudge pots. He added that tomatoes, asparagus and eggplant were the principal crops. Flamingo had a small boom in the early 20th century when speculators thought that Henry Flagler would choose a route for his Florida East Coast Railway across Florida Bay to Key West. By 1900, about 50 families lived in Flamingo, and it had a Monroe County school. Nearby rookeries, such as the famed Cuthbert Rookery, became popular with poachers who sought to kill the nesting birds for their plumage, which was used for fashionable women's hats. Resident and early game warden Guy Bradley was shot and killed in Flamingo after confronting plume hunters. Public rage over the murder directly led to federal legislation outlawing the practice. A fish house was built in Flamingo in 1908 and fishing became the primary occupation of the town, but by 1910, only three homes remained occupied in Flamingo. The Ingraham Highway from Homestead reached Flamingo in 1922 but was poorly maintained and virtually impassable in wet weather until the National Park Service gave it a gravel top in the late 1940s. During Prohibition, moonshining became a major occupation in Flamingo but was eventually suppressed by government agents. The Snake Bight Trail provides an alternate pedestrian access to the sea to the east of Flamingo but its two-mile length is notorious for the number and ferocity of the mosquitoes. The Christian Point Trail is less daunting and leads through open saltwater marl prairie to Christian Point. The area reportedly got its name when it was used as a mass grave after the Labor Day Hurricane of 1935 washed numerous dead bodies from the Keys ashore. Flamingo experiences a tropical climate (Köppen climate classification Am) in which all twelve months have mean temperatures of at least 18 °C (64 °F). Summers are hot and humid and high temperatures average between 88° and 92 °F (31° to 33 °C). Winters are warm and dry. 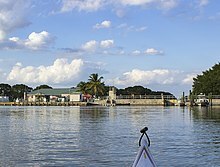 The residents of Flamingo were relocated shortly after the creation of Everglades National Park. Through the second half of the 20th century Flamingo consisted of a restaurant and cafe, a gas station, a marina, a store, a gift shop, a campground, and a few houses for park rangers. In 1959, the two story Flamingo lodge opened, with 103 rooms. There were 24 cabins built as well. Most of these facilities, however, were severely damaged or destroyed in 2005 by storm surges up to 9 feet during Hurricane Wilma. The marina and store have reopened but are currently limited to daytime activity only. As of March 29, 2009 the lodge and cabins had been razed. The gas station remains closed to this day. Flamingo Amphitheater camping popular during the Christmas-New Year Holidays. Docks on the freshwater side of the marina at the end point of the Wilderness Waterway. There are three new plans to increase eco-tourism with improvements to Flamingo, two of which include rebuilding the destroyed facilities. All plans include keeping the historic gas station and Mission 66 visitor center facility. Handicap access will also be added and employee housing and backwater chickees will be replaced in all three plans. Unlike the previous cabins which had been built on the ground, there is a plan for 24 elevated cabins. They would have earth-friendly technology, such as solar hot water and water-harvesting systems. There is a proposal for a new lodge as well, but with only 30 rooms, it would be much smaller than the previous Flamingo lodge. But due to lack of funding resources, plans to build them are on indefinite hold. During the winter of 2013-14, Everglades National Park tested a new structure that is a cross between a tent and a cabin. Called an eco-tent, it’s a prototype for a new type of lodging. The tent structure is elevated, so one does not have to sleep on the ground. The tent sits on a 14-foot square wooden platform, and is designed to take advantage of the breezes coming off of Florida Bay and efficiently move warm air out of the tent. It is currently furnished with bed frames, a table, and chairs. The eco-tent was first used in December 2013 and was available until April 2014. However, it is not clear if the eco-tent will ever go into production. 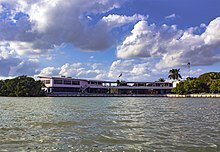 The Flamingo Visitor Center is the pink building located at the end of Florida State Road 9336 overlooking Florida Bay. The visitor center offers many services, which includes backcountry camping permits, trip planning for Wilderness Waterway as well as the trail maps, educational displays and informational brochures. There was a restaurant located inside the visitor center building, named Buttonwood Café. It was the only place to eat inside the Everglades National Park, which offered very limited dining services only during the winter season. The facility was severely damaged by Hurricane Wilma in 2005 and by Hurricane Irma in 2017 and is currently closed. Flamingo is one of the interpretive centers of the Everglades National Park. The hiking trails such as the Snake Bight Trail, Christian Point Trail, Rowdy Bend Trail and Coastal Prairie Trail allow visitors to experience the buttonwood, mangrove and coastal prairie ecosystems. The Coastal Prairie trail leads to the former town of Flamingo. In addition to hiking, the national park offers many paddling opportunities to travelers to explore the wilderness through the mangrove mazes, sawgrass prairies and open waters of Florida Bay. A guided boat tour, narrated by the boat captains, is also available at the Flamingo. Canoe and kayak rentals are available near the marina store. Flamingo's Canoe trails range from half mile short distance to 99 mile long Wilderness Waterway trail and most of them can be accessed from launch areas in Flamingo. As of April 2018 the marina and boat tours are unavailable due to damages from Hurricane Irma. Flamingo area of the Everglades National Park is a quality dark skies site suitable for stargazing, Astro-Photography and Milky-Way Photography. Though more light-polluted than Big Cypress National Preserve nearby due to close proximity to Miami, Upper Florida Keys, Homestead and Florida City, Flamingo offers very detailed views of the Milky Way structure during both winter and summer seasons. It's one of a few remaining dark skies sites in South Florida. ^ Google (March 24, 2013). "Map of Main Park Road, Everglades National Park" (Map). Google Maps. Google. Retrieved March 24, 2013. ^ "Everglades Biographies: Guy Bradley". Everglades Digital Library. Retrieved on July 1, 2010. ^ "Weather". Everglades Weather. 2016. Retrieved 12 September 2016. ^ "Flamingo Visitor Center - Everglades National Park (U.S. National Park Service)". www.nps.gov. ^ "Lost to Hurricanes, the Flamingo Lodge at Everglades National Park Will be Hard to Replace". www.nationalparkstraveler.com. National Parks Traveler. ^ a b "Canoe and Kayak Trails - Everglades National Park (U.S. National Park Service)". www.nps.gov. ^ "Concession Tours in Everglades National Park - Everglades National Park (U.S. National Park Service)". www.nps.gov. Tebeau, Charlton W. (1968). Man in the Everglades. Coral Gables, Fla.: University of Miami Press. LCCN 68017768. Bullen, Adelaide K. (1965). "Florida Indians of Past and Present". In Carson, Ruby Leach; Tebeau, Charlton. Florida from Indian Trail to Space Age: A History. I. Delray Beach, Fla.: Southern Publishing Co. pp. 317–350. LCCN 67004792. "Marjory Stoneman Douglas, 'Mother of the Everglades'". Oh, Ranger!. American Park Network. Retrieved April 24, 2006. Farrell, Kelly (January 18, 2008). "Everglades National Park Planning Upgrades to Flamingo". Naples Daily News. This page was last edited on 2 December 2018, at 01:54 (UTC).